Scissor Sisters formed in 2001 in New York City, and have diverse styles in their music including Pop Rock, Glam Rock, Nu-Disco, and Electroclash. The band first was noticed in England in 2004 after releasing a cover version of Pink Floyd’s “Comfortably Numb”. Since then the Sisters have released many singles and four full length albums with moderate success. 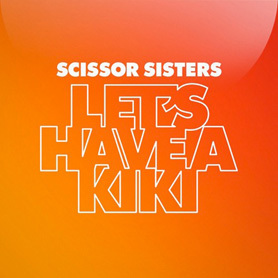 Although having many worldwide chart topping singles and albums the Scissor Sisters have never hit it big with the mainstream masses until now. “Let’s Have A Kiki” comes from the album Magic Hour and is a fun, campy, and outrageous one way conversation with an answering machine. Basically a laid back dance track with a talk over so not the most musical song, however it is very catchy and easy for anyone groove to. Recently peaking at number one on the US Dance/Club Play chart and now looking to go on to global success. This Kiki is Marvelous, so remember to work it with attitude and say; Kiki, SoSo, Oui Oui, Non Non!